Last year I hosted Thanksgiving at my house, which meant not only did I have to clean behind the toilet and wipe off the three inches of dust that collected on the ceiling fan, I also had to provide the turkey. Now, I’m a pretty experienced cook but the thought of tackling the turkey freaked me out. I couldn’t face the possibility of burning the bird and having to serve cold cuts along side our beautiful casseroles and perfect pies. Luckily, my mom had come into town and she walked me through the basics. I also added in a couple of ideas of my own and we ended up with a fantastic turkey and a magical meal. I had a few requests from friends to share my turkey tips, so here you go. DO plan ahead. Most turkeys are sold frozen, so you’ll need to plan for defrosting time. It takes 24 hours to defrost 5 pounds of turkey, so do the math and realize that 20-pound bird you’ve purchased needs four days just to reach a non-frozen state. DON’T defrost the bird in the sink. It must be kept cold. Place the turkey in the refrigerator in a jelly roll pan lined with paper towels so you don’t end up with unwanted juices mingling with the fresh produce. Salmonella is not a good way to lose the holiday weight. DO remember to remove the giblet bag once your turkey is defrosted. It’s not a nice surprise to pull it out in the middle of carving your bird at dinner. DO brine your turkey. Once your turkey is defrosted, you’ll need an extra 12 hours to brine it. The night before, while you’re off marinating yourself in martinis in order to calmly handle your houseful of relatives, soak the bird in a salt solution in order to increase the moisture holding capacity of the meat. You can choose from many brines, like this one here, or this one, or this. DON’T substitute one cup of table salt for one cup of kosher salt when making your brine. Table salt is much saltier. DO continue to keep your bird chilled while brining. 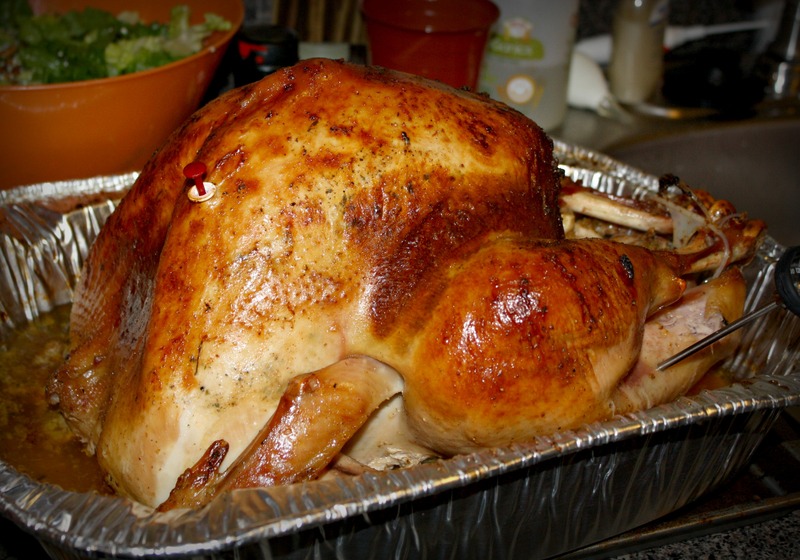 You must keep your turkey chilled to at least 40 degrees Farenheit during the brining process. If your brining container won’t fit in the fridge, put the turkey in a cooler, cover with ice, and pour the brine over the top. Stick it in the garage overnight if it’s cool outside. Last year, my turkey hung out in its cooler in the bathtub. To be completely honest, it was very odd to be doing my business next to a large dead bird, but definitely worth it. DON’T attempt to deep fry a frozen or wet turkey. It will explode and burn down your house. Seriously, Google fried turkey mishaps. You’ve been warned. In fact, here are some great tips for frying birds. DO let your turkey come to room temperature before cooking it. It will roast/fry/smoke more evenly that way. Now, if you’re smoking or frying your bird, check here and here for tips on those two methods. I’m going to continue on discussing how to roast the perfect turkey. DON’T be afraid of the butter. Pull a Paula Deen and set out a whole stick of butter, y’all. Soften it, then gently separate the skin from the bird and rub that butter all over the place. Give the bird a nice butter massage. DO be creative. If you want to use herbs, place them inside the gap you’ve made between the breast and skin. If you like citrus, throw some orange slices into the bird’s cavity. Be sure to salt and pepper the skin as well. If you don’t have a roasting rack, line the bottom of a roasting pan with carrots and celery stalks to elevate the bird. DON’T ever cook the turkey with stuffing inside. Yes, I know that’s how your mom did it. No, the fact that fact that you never got sick doesn’t discount the fact that it’s a recognized health hazard. If you must have your dressing flowing out of the turkey as you place it in all its glory on the table, stuff it with separately cooked stuffing when you pull it out of the oven. DO truss up the bird’s legs for more even roasting. Also, it looks cool. Look, you’re a chef! DON’T forget to preheat the oven. It can take 30 minutes for a cold oven to reach 325 degrees Farenheit. DO roast the bird with its foil-covered breast side up in the oven at 325 for 20 minutes per pound if previously frozen and 12 minutes per pound if fresh. DON’T even think about peeking until about 45 minutes before you estimate the turkey to be done. Remove the foil so the breast will brown and check the internal temperature. Baste with the pan juices. DO ensure that the meat reaches 180 degrees at deepest spot between the leg and the breast. DON’T immediately cut into the bird. Tent it with foil and let it rest for 20 minutes so the meat can absorb all the juices back in. DO lay claim to your favorite piece before allowing anyone else near the bird. After all, you’re the one who’s been working on this dish all week and if you want a leg, dammit, you get a leg. If you happen to run into a turkey emergency, don’t forget the awesome experts at the Butterball Turkey Talk-Line. I’ve never used their services, but I’ve heard that they are enthusiastic and very helpful. Also, if you’d like to bring something besides green bean casserole to your family’s celebration this year, try this corn casserole from The Bearded Iris. Good luck and have a Happy Thanksgiving! Did you know the Pilgrims ate venison not turkey? These are great tips! But…although you never answered me on twitter the other day…I’m pretty sure you’re supposed to be coming to my house to cook the turkey. I really hope you haven’t changed your mind because I’ve planned my whole Thanksgiving around you being here. I am dining with the inlaws this year! Perhaps next year you can fly down to Texas on those pretty pink wings and join us for some Cajun fried turkey! Yum! Cajun fried turkey sounds amazing. **DON’T be afraid of the butter!! ** My Fave. –Why can’t I cook the bird w/ stuffing like mom does? Picture this: You’re stuffing bread, which absorbs things, into the cavity of a raw bird. All the juices in that raw bird are absorbed in the bread, on the innermost part of the dish. If that bread doesn’t reach a safe temp, you’ve got raw bird juice on your stuffing. I threw up in my mouth typing that. All great information – I actually did a turkey breast grilled this week – much easier and quicker. Usually I host 20 folks at the house and make the ENTIRE meal! The entire meal?! Is there drinking involved here? I don’t know if I could feed 20 on my own. I at least need a sous chef. I know – it’s crazy! I cook for days and days non stop. Appetizers, the meal, desserts and *yes* drinks! It is a TON of work, but very satisfying! The good news is I don’t do any dishes….and I use regular plates! This year, we’re actually going out with friends. It’s gonna be really relaxing! This is why I’d leave the turkey cooking to the experts. I’ll probably blow up the house trying to fry one. Im seriously impressed and in love with this tutorial. Also, injecting was a big fad awhile back. Involves stabbing the bird repeatedly with a large bore needle full of melted butter and spices. Um, yum? This is definitely a must have list for everyone. Thanks! The last couple years I’ve done Thanksgiving and Christmas. This year I’m not doing Thanksgiving, and I’m kind of sad – no turkey for me to buy or make this year! Mmm…. I love turkey! It’s my favorite part of the season! I always brine my turkey and butter the hell out of it! It really does make a difference! Once upon a time I was a housekeeper at a chalet resort. The residents of one of the cabins decided to have a traditional “Canadian” Thanksgiving, replete with turkey and all the fixin’s. They purchased a fresh (not frozen) turkey from the local grocery store, and left it out at room temperature for 24 hours, cooked it for two hours, and, well…. My supervisor had to clean that cabin. The rest of us caught the smell at the door and elected not to enter. Wowza. The smell still emanates from your comment. BLARGH. My family always cooked the stuffing inside too, but I just can’t now that I’ve read about the bread soaking up the raw turkey juice and not cooking properly. BLECH. Do marry a man who is willing (and able) to cook the bird for you while you handle your in-laws and enjoy a glass of wine! Seriously though, loved the turkey tips….we always do ours Paula Deen style y’all! HAHA! That’s a great tip. Hubs doesn’t boil water well, so I’m SOL. That looks so yummy! I can’t wait until Thanksgiving now! Yum! Turkey! My dad’s neighbor will be frying a turkey for us this year. I’m going to pass along the whole 4 days to defrost thingy. Pass on my address so he can send us a fried turkey as well. 😉 Happy Thanksgiving, Maddie! So what time is dinner? I’ll head on over! For me I DO let someone else do the cooking. It’s safer for all of us. I’ve seen your culinary efforts – they looked pretty good. 🙂 Of course, you do truly excel at cocktails though. I have committed just about every sin mentioned above, yet we still do our own birds year after year. Shockingly, the same people plus more keep coming. This year we will need to fry 4 birds. Looking back, I am THANKFUL for my exquisite taste in friends!!!!!! I actually have used a brine, in a cooler no less. Can you believe it?! And it tasted really, really good. Not this year, though. I won’t be cooking this year. BUT, I do get a free turkey from my Pampered Chef show, sooo…I will definitely come back here for these tips around Christmas! You’re so fancy. I can totally believe it. Free turkey? Dang. I love Pampered Chef, I wish that show had been in my budget! Seriously I had no idea you had to defrost a turkey for that many days! These are some great tips…as you can see I’ve never had to prepare my own turkey. I need all the tips I can get! Ok, shhhh, I’ll tell you a secret. In an emergency, you can thaw it, wrapped, in the sink full of cool water that you change every 30 minutes. It will probably take all day and waste a ton of water, but it will work. Great tips. Last year I cooked the turkey. I wanted to brine it, but I wasnt able to figure out what to put it in. The only pot I own that fits a turkey is roasting pan. Submerge a turkey it wont. I ended up doing a special salt rub technique I read in some foodie magazine. Had to empty the entire fridge to fit it in. Stupid side-by-side. Wish I had thought of the bathtub idea. I now pronounce you Goddess of the Big Bird. Day-yam, girl. Impressive! My husband grills our turkey every year on the Weber. Not only does it taste amazing, but I love that he takes responsibility for the main course. Phew – what a load off my plate! Great tips, except cooking the turkey to 180 degrees. The USDA now says you can eat the turkey at 165, which will result in a much juicier bird. 180 degrees will produce a very dry breast. I roast mine at 500 for 30 minutes, and then at 350 until it’s done. My 27 pounder took just over 2.5 hours on Thanksgiving.